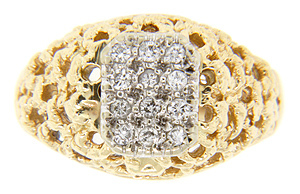 A white gold and diamond lattice crowns the top of this 14K two-tone estate ring. 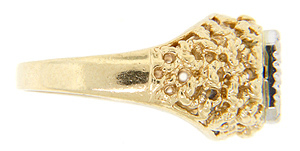 The bottom portion of the ring is yellow gold. 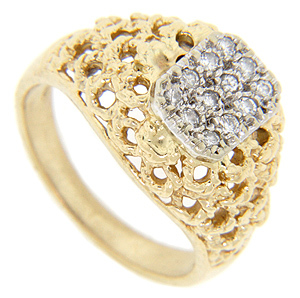 Surrounding the diamonds, the ring has a looping, circle design that complements the shape and size of the diamonds. 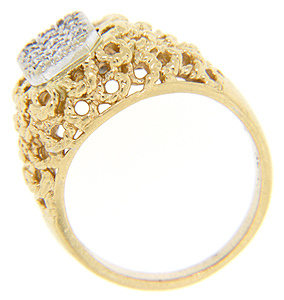 The ring measures 11.5mm in width. Circa: 1980. Size: 6 1/4. We can resize.